That is, for the paint on our walls from the point of view of treating mould. Red could in fact be worse – notice how it’s always red colours that fade first in the sun – and deep blue or green might be affected. But white, cream, fawn, yellow, yellow ochre, pale green – all the really conservative colours – are more-or-less completely resistant to the bleach in the anti-mould spray. Don’t get me wrong: I like the boldness of the strong pink in our largest room, but it’s a real nuisance when it develops fuzzy patches or, worst of all, pale vertical stripes where drips of the spray have run. This is the worst year ever for the grey mould which appears as a grubby shadow on the ceiling wherever it meets the outside walls. Of course to treat the white ceiling wouldn’t be a problem – it’s just the pink wall adjacent to it. So I’ve been trying to develop a ‘mobile masking tool’ to hold up into the angle between wall and ceiling. It has to have a handle so I don’t spray my hand. In the picture the ‘handle’ has been propped up with a measuring tape and a roll of masking tape because I haven’t glued it yet. 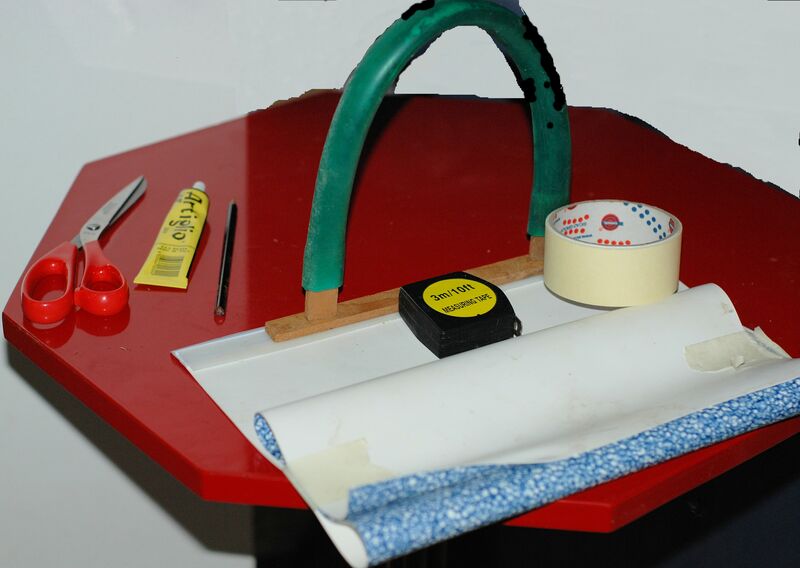 I’m waiting for the glue to dry on the stiffener. The vinyl is looped up as a drip catcher. I hope my invention works. If not I have a more elaborate Plan B for how to tackle the problematic decor. 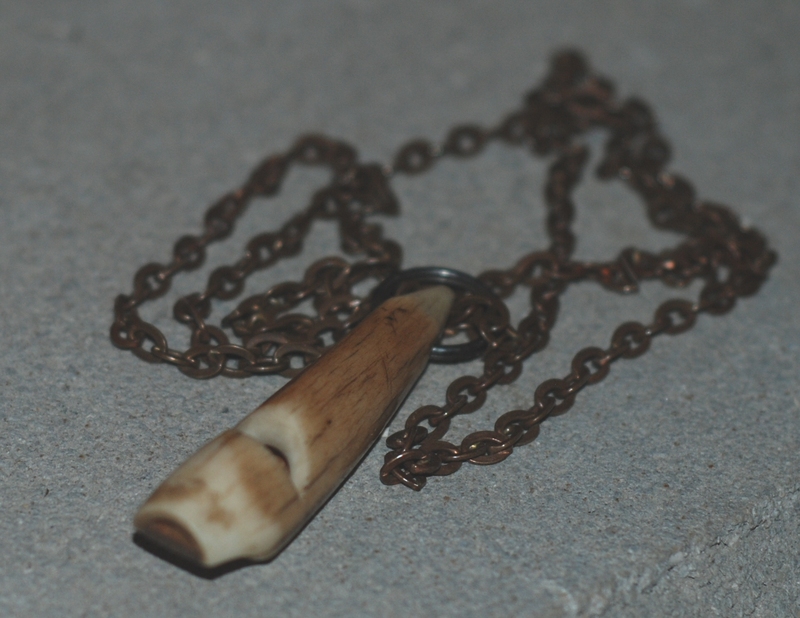 This bone whistle, which I once wrongly thought was a ‘dog whistle’ – that is, one which sounds at frequencies audible to dogs but not to humans – was a godsend until today. I’ve been calling Kepler with it, using a rapid piping note, and eventually, for the most part, he’s appeared on the path between the orchard and the olive grove on his way back from the neighbours’. This morning, piping as I went, I walked on the slippery, frosty path through the far olive grove (invisible from the house) as far as the deep ditch that separates our land from the neighbours’ house which is on the opposite bank. There was Kepler in his Elizabethan collar, running around with their dogs which number at least 4. He started down the bank towards me twice, then seemed to be discouraged by the terrain, which is steep and wooded like that of a natural citadel. The whistle was mainly useful in letting the humans know I was there. “Go to Mummy! Don’t you want to go to Mummy?” This in dulcet tones from the wife who was hanging out clothes. “He’s no problem to us,” called the husband. “Shall I bring him round to you?” offered the husband. “No, thank you all the same. He needs to come back on his own.” I had visions of the husband starting up his car, opening his gate and driving round, which is what he normally does when he comes to see us. “If you make him unwelcome he’ll go away. Turn a hose on him!” I suggested. I thought not. Down-town guy and all that. I don’t know quite what they did next – said “Shoo!” or something. Anyway he hurtled down the slope this time without stopping, overshot me, circled the olive grove twice, and then accompanied me indoors where I gave him a handful of his dried food. A nice peaceful start to Sunday morning. Neutering, castration, sterilization – I don’t know which is the uglier word. But it’s what happened to Kepler today. Joules and Taylor have both been ‘done’ so there was no choice in the matter. I sat with Kepler in the vet’s operating room till about 10.00, when the anaesthetic took effect, and by 11.45 he was ready to leave, groggy but strong. He tried to run away up the drive when we got home, and it was only because he stopped to pee that I caught up with him. 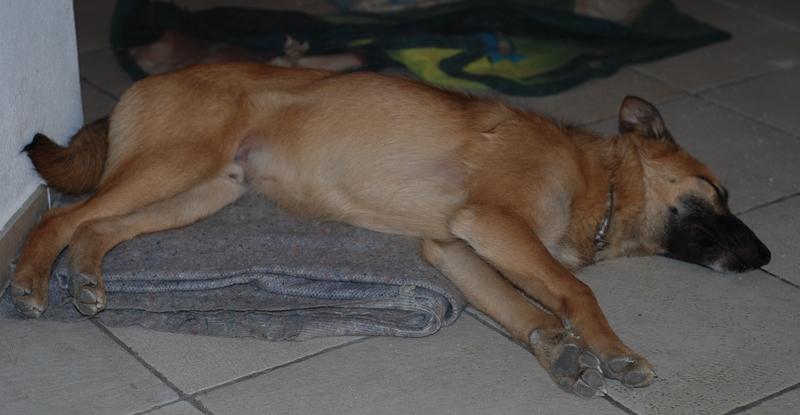 After that he slept for a couple of hours in front of the stove, twitching in continuous spasms. Now he’s sleeping peacefully under my desk, complete with Elizabethan collar. 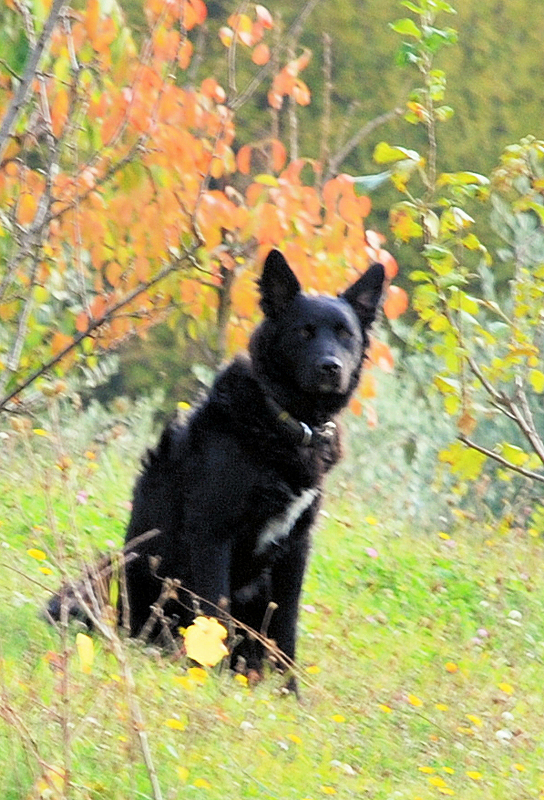 I hope his protracted visits to the neighbour’s dogs had a large hormonal element and that we shall now see a little more of him. Although there’s a little less of him to see, poor little chap. That’s just in one day. I think he’s letting us know what he thinks of his curfew – which has not been at all strict in any case. Yesterday we discovered a nasty, festering sore in Joules’ armpit that he has, of course, been licking. I phoned the local peripatetic vet who I thought might have gone to work in Norway. Luckily he hadn’t. After he’d examined Joules, I asked him to take a quick look at the redness by Kepler’s private parts. He took this seriously and advised me to put the same antiseptic foam on that I will use for Joules. Kepler started licking it off – hence the Elizabethan collar. The vet also asked what Kepler had been eating, and in particular how much. It was something about toxicity – I didn’t follow him at all – but the upshot is that I must feed Kepler less for 4 or 5 days. I decided not to give him breakfast any more, which I would have been weaning him off soon anyway. 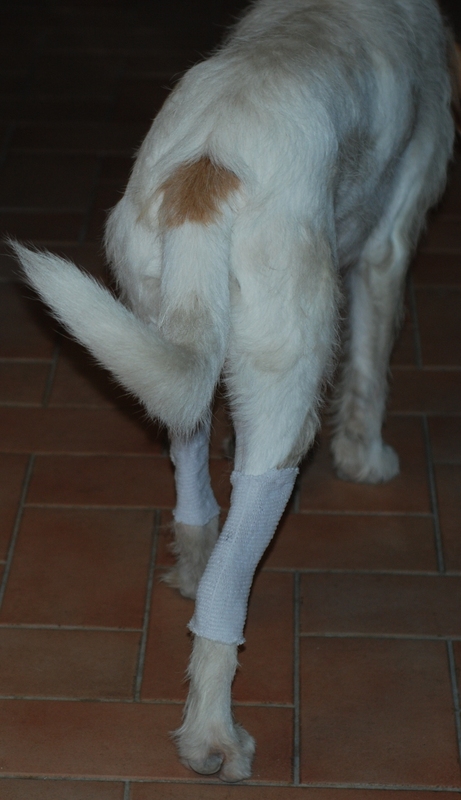 This time it’s his hind legs: the skin over the Achilles tendons, to be precise. 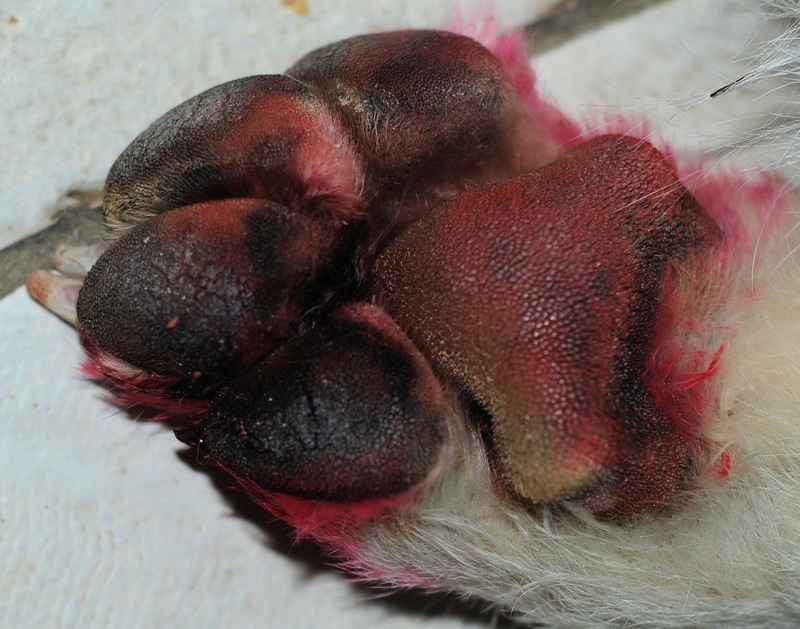 He has a series of sores, which scab over and then become raw again as he licks them, which he does wherever and whenever he gets the opportunity. It’s occurred to me that it’s a form of psoriasis, perhaps brought on by the stress of Kepler’s arrival. 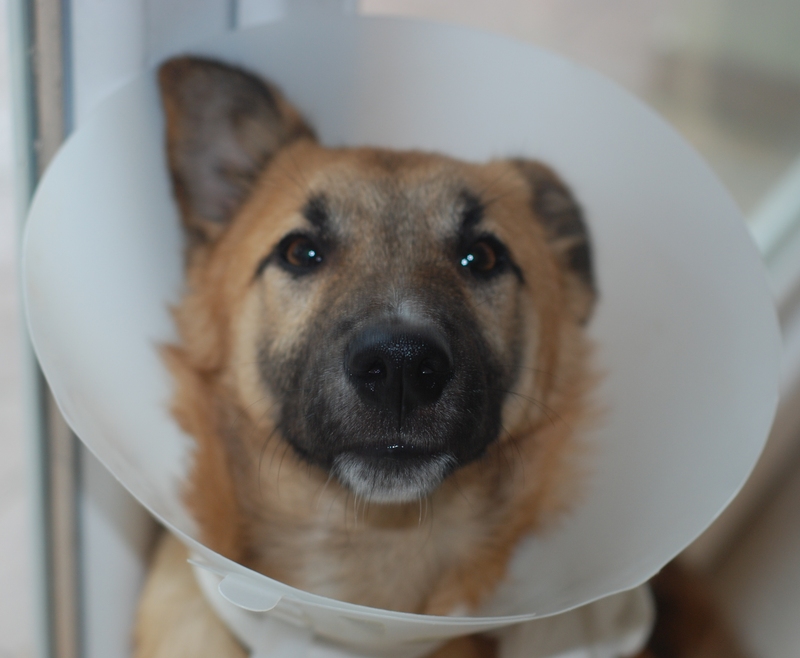 Be that as it may, Kepler certainly helps to keep the sores going, biting them with his needle-sharp teeth, untying the Elizabethan collar strings, and helping to undo any bandages . Today, I tried encasing Taylor’s legs in some tubular bandage left over from Joules’ wound dressing. The leggings looked smart, and I even felt that Taylor accepted them because of their aesthetic appeal. But they were soon the object of Kepler’s devoted attention. One way or another, they weren’t going to survive a trip outside, so I took them off. I need to think of a better idea.